Yobe State. “We have 47 dead and 79 wounded,” he added while expressing the conclusion that the Muslim sect known as Boko Haram may be responsible. So far, the group has not acknowledged its role in the crime. The deadly attack came just a day after the release of a new video produced by Abubakr Shekau, the leader of Boko Haram, a group that has unleashed bombings, mass killings, rapes and abductions for several years in an effort to impose Islamic rule in the oil-rich country. In the video, Shekau flatly rejected, once again, an appeal by the government for a truce and peace talks. Witnesses at the school report that they heard a blast followed by the screams and clamor of the injured. 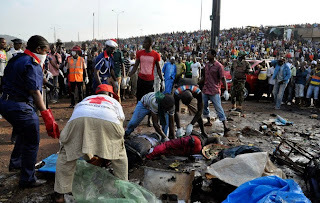 According to AFP, an eyewitness identified as Adamu Alkasim said that he saw pools of blood and shredded body parts at the scene of the crime that has galvanized a horrified nation. 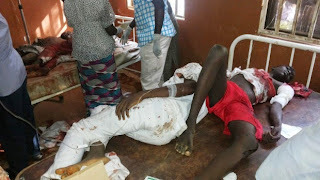 The survivors were taken to hospital in Potiskum, just 300 feet away from the affected school, and are exhibiting various levels of injuries. Boko Haram is known to have carried numerous armed terrorist attacks, including the bombing of a United Nations facility, since 2009. In February, for example, it is believed that masked men belonging to Boko Haram murdered 40 students while they slept at a boarding school in Buni Yadi, a town that is also in Yobe State. In April, Boko Haram struck a school in Chibok, Borno State, and abducted 276 girls. More than six months later, at least 219 of the girls remain in Boko Haram’s control and are feared to have been subjected to sexual servitude. Potiskum, a commercial hub in Yobe, has suffered previous attacks by Boko Haram. On November 3, at least 15 persons died when a suicide bomber detonated his explosive device at a Shiite Muslim ceremony. On the next day, 16 suspected members of Boko Haram who had been arrested by Nigerian security forces were found shot to death. Yobe is one of the three states in northeastern Nigeria that have been under a state of siege since May 2013. Boko Haram has struck at least 20 times this year in Yobe, casting doubt on the government’s ability to rein in the terrorists. In the video released by Boko Haram on November 9, Boko Haram combatants were seen parading next to a tank in a an unidentified Nigerian town. Leader Abubakr Shekau was seen leading the marchers. The 44-minute-long video appears to have been made to prove that Boko Haram has indeed created an Islamic state or caliphate, much like the one that is currently seeking to control Syria, Iraq, and Lebanon.